30. What degree or certificate will you be working on when you begin the 2019-2020 school year? 1st bachelor’s degree .............................. 1. 2nd bachelor’s degree .............................. 2. Associate degree (occupational or technical program) .............................. 3. Associate degree (general education or transfer program) .............................. 4. Certificate or diploma (occupational, technical or education program of less than two years). .............................. 5. Certificate or diploma (occupational, technical or education program of two or more years) .............................. 6. Teaching credential (nondegree program) .............................. 7. Graduate or professional degree .............................. 8. For this question, you are asked to report your intended degree or certificate for which you are apply for Federal financial aid. The Department of Education wants to know what area of study you intend to undertake academically while receiving federal funding. Undergraduate programs offer different types of aid and different amounts of federal financial aid compared to graduate types and amounts. Select one of these options from the drop down menu. 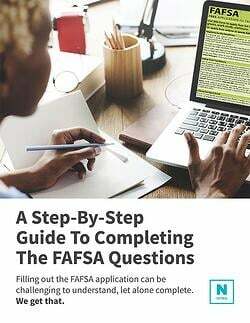 What is the 1st bachelor's degree on FAFSA? A 1st Bachelor’s degree selection means that you had not previously sought or completed a Bachelor’s degree at an institution of higher education before this point. An Associate’s degree is not a Bachelor’s degree, for example, so that you could enter “1st Bachelor’s degree,” if you possess an Associate’s degree already. You do not enter “1st Bachelor’s degree” if you have already received one from an institution of higher education, even if it is for a different major.